In our previous article we looked at the rise of people analytics and why you should use it as a competitive weapon. We explored how this new approach to talent management is becoming increasingly widespread. The time for you to invest in people analytics is now, and the steps outlined in this article will help you to launch and improve your people analytics function. XpertHR Benchmarking found that 95.5% of HR professionals have experienced difficulties in gathering and analysing data. Research indicates that this is due to inaccurate data, and/or poorly integrated data systems. David Green, global director of people analytics solutions at IBM, advises that for successful people analytics, HR should be “focusing on projects that actually matter to the business.” This will enable you to identify metrics that are aligned with business objectives. Organisations should undertake performance benchmarking assessments against the same metrics at least once a year. Successful people analytics relies on both quantitative and qualitative data. Caren Ibn, HRBP director North Europe at Levis, highlights the importance of knowing your employee profiles, asserting that “data is nothing if you forget the human element. This also feeds into the outcomes. Andrew Spence, HR consultant at Glass Bead Consulting, recalls a bank that installed a 24-hour helpline to combat the issue of stress-related sickness – a solution derived from people analytics activities. Andrew explained that the solution itself was “quantifiable in the sense that it knew how much it would save them” but qualitative in its “human element, as a long-term wellbeing initiative. Leading data is where people analytics has the most impact. Unlike lagging data, which evokes reactive action, leading data enables “managers to understand the strategic investment that they’ve put into their existing team in order to ready them for future success.” Focusing on this allows you to be proactive and therefore embed future proofing solutions. “If you get the data but don’t follow up, it’s a pointless exercise,” says Tracey Elverstone, head of HR, Staffline. She continues: “The challenge is whether managers see the correlation between those analytics and their actual experience. Using robust systems to collect the right data is a good starting point, but knowing what to do with it is crucial. Using focus groups helps uncover in-depth insights into what’s working, what’s not working, what’s missing, and how to improve upon current success. Furthermore, Salina Gani, head of HR at Le Pain Quotidien, acknowledges the benefit of gleaning “inspiration from other businesses that are doing well”. Salina points out: “everything you’re doing is about understanding your employees better.” This enables organisations to make tailored decisions. For example, tracking employees that are building career paths gives managers information about what training is required and at which stages support is needed. Since people analytics places employees at a critical part of the supply chain, analytics can uncover hidden drivers of issues. David Green observes that “organisations that have successfully invested in people analytics are reaping the rewards” with improvements in “employee experience and wellbeing through personalising services such as onboarding and learning”. Glassdoor’s 2017 statistical analysis identifies company culture, employee salary and stagnating in the same job, as the top three factors affecting employee retention. Successful people analytics can help better understand engagement drivers. While there is no one-size-fits all approach, the steps outlined below will help you effectively launch people analytics in your organisation. Focusing on what your organisation is trying to achieve can inform recruitment decisions and increase employee performance, happiness and retention. Forming insights from existing data is an invaluable way of establishing trends. As your people analytics function grows, this will be enriched with the addition of new data. Your understanding of the business and the analysis of existing data will help you decide what data you need to collect. At this point you can use software to establish patterns which could lead you to identifying measurable metrics. Adopting a trial and error approach to tackle small but urgent business problems you have identified enables you to gain momentum. You can use the results of interventions to scale solutions to larger or wider business issues. Use the early results to secure stakeholder buy-in. Always try to report on metrics that directly impact the business objectives. If you have started small, you may not have access to large amounts of time and budget. However you can still be pragmatic and embed solutions – think about the bank that implemented a 24-hour helpline. Once you have placed your people analytics results on the map you can use the buy-in to invest in refining your team’s analytical skills and technology that can enhance the process. 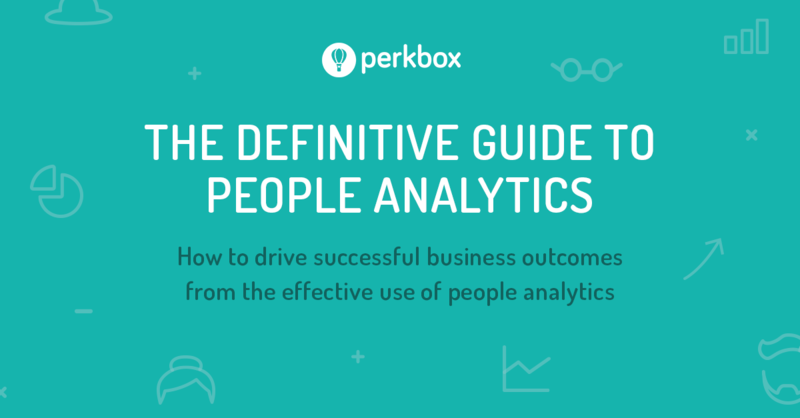 To find out more about how organisations are successfully implementing people analytics to improve their employee experience and organisation’s bottom line, go ahead and download The definitive guide to using people analytics to inform business strategy. Download the People Analytics whitepaper by clicking on the image below, or click here.